This week, the temporal proximity of two of our day trips provided our students with a study in contrasts. There are three day trips incorporated in the three-week ART in Orvieto program, these two being proceeded by a sojourn in Rome. This year, our Assisi and Florence trips happened on the Wednesday and Friday of the same week, in distinction to last year (when they were a week apart). 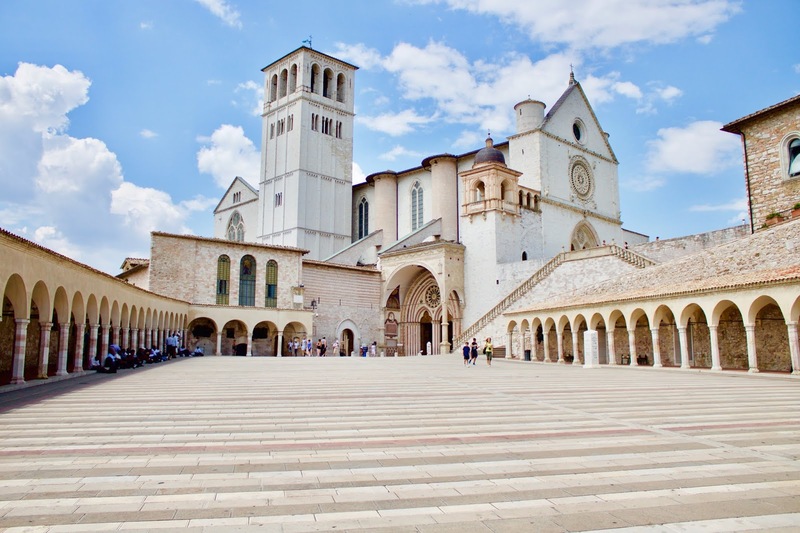 The Assisi trip is the first of the two for the simple fact that works Dr. Smick highlights in Assisi are older than those which are our foci in Florence. One of our course readings, a selection from Giorgio Vasari’s Lives of the Artists, shows the significance of each city’s treasured works within Italian art history. Vasari is included in our syllabus not just for this biographical content, but for his philosophical content; because historical writing is never uncontextual and a reader may see emerge from Vasari’s biography a dedication to certain aesthetic concepts, particularly an interest in the idea that some art discloses a sort of "grace" or "gracefulness." And consequently, that some art does not. 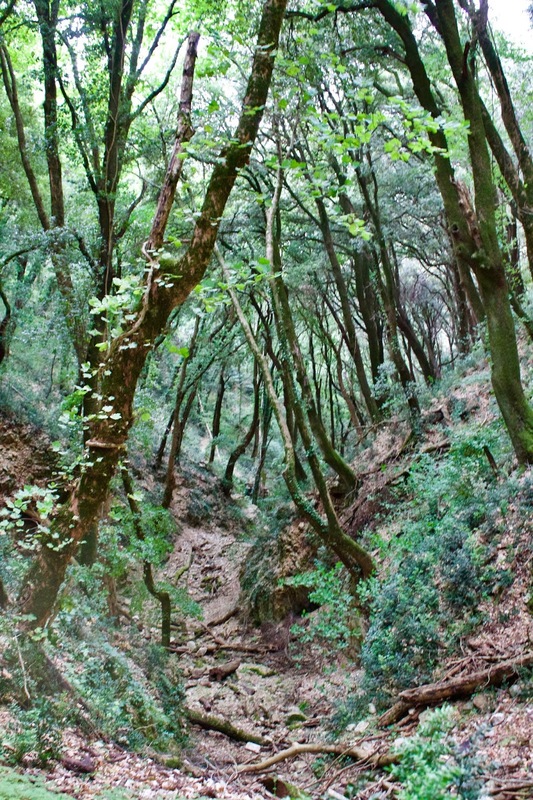 Our day in Assisi was as much a contemplative’s journey as it was an art history field trip. Before leaving, many of the students had read selections of Bonaventure’s hagiography on St. Francis, and we paused throughtout the day to re-read some of those passages and some Franciscan prayers at each of the sites. Besides bringing a real spiritual warmth to our day, this had the added benefit of highlighting the interactions between literature and image in the early middle ages. We started our day at San Damiano, the crumbling monastery where St. Francis received a divine message to rebuild the Church, starting from those very ruins and continuing outwards. Francis eventually gave the monastery to St. Clare, and it became the first home of the order of Poor Clares, the sister order of Franciscan nuns. Next we saw the Basilica di Santa Chiara, the church built in her honour and housing the belovèd San Damiano cross. Even before lunch time we made it up to the hermitage of St. Francis and his brothers, then picnicking while overlooking the valley that Francis himself observed in his many months of isolated contemplation. From there, our itinerary took us to the Basilica Papale di San Francesco. 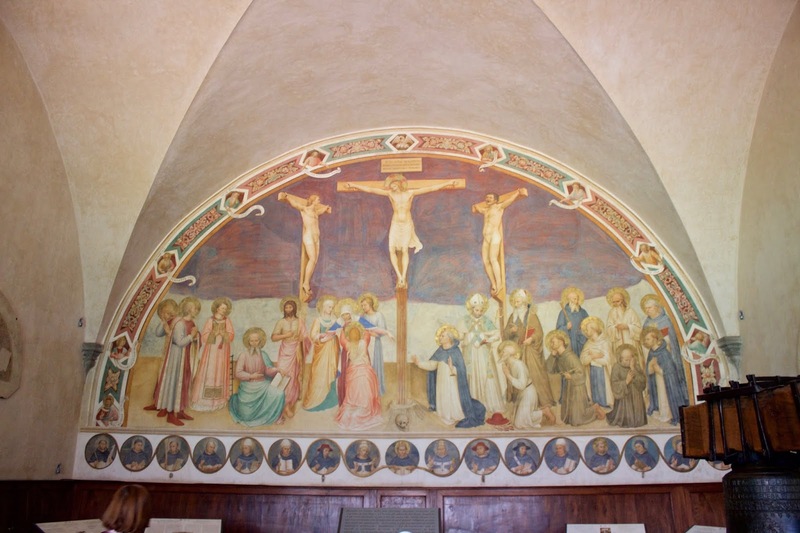 The Bonaventure readings became especially important here, since the fresco cycle in the Basilica depicting the life of St. Francis (attributed in Vasari’s time to Giotto) is drawn directly from Bonaventure’s description, so that one may read a page or two in front of each fresco and see how all the description was transliterated into painting. The Assisi trip is so full of gracefulness and contemplation, and so steeped in a type of patient, calm spirituality, that we were fully prepared to be startled by the rhetorical overtures of Vasari’s commentaries. Vasari’s contention was that artists like Michelangelo, Raphael, Leonardo, and Titian had managed to capture a certain divine je ne sais quoi in their art that previous Italian artists had not managed, in no small part because they had access to recently uncovered Greek and Rome sculpture (Michelangelo even being present at the disinterring of some pieces). Of the artists who immediately proceeded this titanic group of painters he says “The distinguised artists described in the second part of these lives made an important contribution to architecture, sculpture, and painting, adding to what had been acheived by those of the first period the qualities of good rule, order, proportion, design and style. Their work was in many ways imperfect, but they showed the way to the artists of the third period and made it possible for them, by following and improving on their example, to reach the perfection evident in the finest and most celebrated modern works” (Preface to Part Three). How convenient for Vasari that all the best artists were of his own day! Conversely, Vasari says of Giotto: “Now the work of Giotto and the other early craftsmen did not possess these qualities, although they did discover the right principles for solving artistic problems and they applied them as best they could. Their drawing, for example, was more correct and truer to nature than anything before…they in turn fell short of complete perfection, since their work lacked that spontaneity, which, although based on correct measurement, goes beyond it without conflicting with order and stylistic purity” (ibid.). The trip to Florence is when students get to see some of the works which number among Vasari’s "A-list." 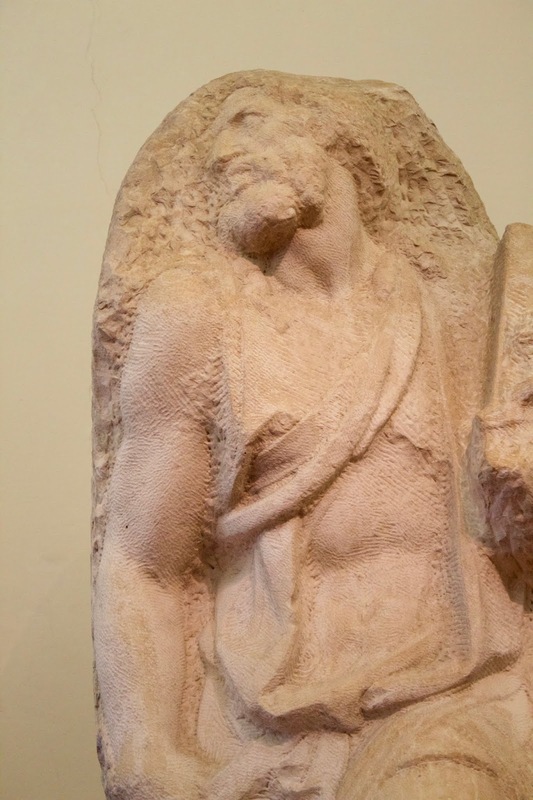 A stop at the Academy provided the chance to see, in addition to the David, some of Michelangelo’s Non Finiti, the unfinished carvings he began for Pope Julius II’s tomb. “But the man whose work transcends and eclipses that of every other artist, living or dead, is the inspire Michelangelo Buonarroti, who is supreme not in one art alone but in all three” (ibid.). There is an undeniable breathiness to them, that spontaneity of form and motion which Vasari considered lacking in Giotto and other "craftsmen." In Florence, among other sites, students saw the San Marco Monastery (chock-a-block with stunning Fra Angelico frescoes) and the private Magi chapel in the Medici palace. These pieces set up the median between Giotto and Michelangelo, in the mind of Vasari at least. Michelangelo’s genius was that his "design, artistry, judgement, and grace," (ibid.) came with ease. But any cursoury examination of Michelangelo’s life or writing show the torturedness which really followed his creations, the pressure he felt to produce art with such liveliness, and the existential disappointment he felt when he considered that he had failed. Besides the problematics of setting up art history as a continuum toward ever greater works, there are two things which much be accounted for: the gracefulness present in Giotto’s work despite Vasari’s lackluster review, and the identifiable but nearly intangible "something" that he correctly sees in Michelangelo. It seems that both these things might be better accounted for with phenomenonological experience, or at least that the theory might be found nestled there. 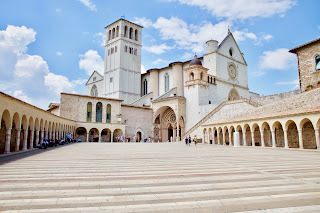 The two times which I have followed this itinerary around Assisi (I lean here on the full Latinate sense of "journey-ing" rather than merely hitting points of interest) have served to bring a sense of humility and sacredness of place that is recognizable by even the most Stoic or Protestant corners of my heart. Giotto’s frescoes, albeit with less naturalism than later Italian painters of Vasarian approval, have a piety which seems appropriate to the life of Francis. I hesitate to affirm that simply replacing Leonardo or Titian as painter for Giotto would increase the "grace" of the space. There is a gesturing toward the Beyond, especially in the image of Francis’ Stigmata, which is not collapsable to it being a represent ion of a sacred moment in narrative form. The story alone is not what moves, but its portrayal by Giotto specifically. There is a sense of divine light moving between the surprised and delighted Francis and the six-winged angel who delivers nail marks to his hands and feet. Giotto’s individual style contributes to the grace present in the work, he does not merely record Bonaventure as perfunctorily as possible and then dust off his hands. Similarly, much of the literature that we’ve taken up in class over these three weeks seems to deal with the idea of whether art can be religious because God drops inspiration into the hands and minds of artists, or because those artists are created in the image of God and subsequently create works that are transcendent. We’ve come to affirm both as true, through examples as diverse as Orthodox icon writing (God writes through human hands so inventiveness or novelty is not needed) and Michelangelo being convinced that a form was ordained for each piece of marble but that he alone was responsible for bringing it into being. Indeed, his Non Finiti jump to be released from their stone, a more willing Galatea to his Pygmalion chisel perhaps because God-as-first-creator is acknowledged in his process. The ART in Orvieto program of 2018 is in its final week. Expect a final reflection soon! Joyfully, learning about this je ne sais quoi gracefulness in philosophical aesthetics can continue back home; Dr. Smick will teach a class entitled “Grace as an Aesthetic Concept” in Toronto, Fall 2018. Julia de Boer is a PhD student at ICS and assistant to Dr. Smick in Orvieto, studying philosophical aesthetics and linguistics. Orvieto had a special place in her heart, even before she went on the ART in Orvieto course the first time, and she continues to fall deeper in love with this city on every sequential visit. Photos by Julia de Boer.